Prayer? There's An App For That! Are you looking for a great way to pray Examen daily? Sign up for the EXAMEN app to experience God like never before! The great philosopher Socrates once said that "the unexamined life is not worth living." When we pray the Examen prayer faithfully, we will find that life is worth living and the examined life is greatly worth living! The Examen Prayer helps us discover the presence of a very personal God in our lives and remain that love. St Ignatius initially developed the Examen Prayer with five points. Though you can find many different versions of it we are going to use the initial five points in his original ordering: Gratitude, Petition, Discern, Forgiveness, and Resolution. The Examen prayer can be a difficult prayer to learn and to pray on our own. This guide will help you appreciate and learn how to make this important prayer part of your daily life. Once we learn how to pray the Examen with God, it becomes a wonderful time of grace! I first learned of the Examen Prayer when I made my first eight-day retreat while I was still in the seminary. Fr. Bob Welsh was a Jesuit Priest who helped me to God in a very real and personal way. He handed me a little card with the steps of the Examen Prayer and smiled with a twinkle in his eyes saying: "You might find this helpful." Over the years, I have found it difficult to pray unless I actually sit down with a journal and follow the points step by step. A couple of years ago, it was suggested to me by a very wise priest, Fr. Timothy Gallagher, that I should do whatever I could to make this prayer accessible, memorable and doable, it was then that I realized if I had an app for that, it would really help me. My hope and prayer is that through my direction, the wisdom of St. Ignatius, the use of modern technology, and ultimately through the guidance of the Holy Spirit, you will find yourself tremendously blessed by using this app each and every day. You will find a couple of key points most practical. Set a time: First of all, St. Ignatius suggests doing this prayer twice daily. If you use the app, you can set custom times so you will have reminders to pray this sometime in the morning and sometime in the evening. If you prefer to pray this on your own, you may consider setting timers on your phone or at least picking two times to pray it during the day. For example, I remind myself to pray the Examen Prayer at 4 PM and 10 PM. If you are a morning person, you may want to try at 10 AM and 4 PM. The Examen Prayer is not meant to be burdensome. As a matter of fact St. Ignatius said to spend no longer than "a quarter of an hour" or 15 minutes. If you are using the app, you can set your own goal anywhere from 3 minutes to 15 minutes. Journal: It really helps to journal as well. If you are using The Examen Prayer app, there is a journaling feature. Some people also really benefit from having a paper journal instead. St. Ignatius always said: "Go where there is fruit!" Meaning use whichever is most fruitful for you! Remember: Find creative ways to remind yourself of the resolution that you make each day. I found I would often forget what my resolution was the next day when I woke up. The Examen Prayer App has a feature that will do this for you automatically. But you may also want to find ways of doing this for yourself - either by reviewing your journal first thing in the morning or adding it to your calendar. When you review your journal, you will remind yourself of the resolution that you and God made together the night before. The Examen Prayer will tremendously impact your day and begin to change your path forever for the greater glory of God. "The choice of the time and duration of the prayer arises from a determined will... one makes time for the Lord, with the firm determination not to give up, no matter what trials and dryness one may encounter" (CCC 2710). First, give it a try at least once, and then you may want to commit to praying the Examen every day. He said that if we were ever to drop any prayer time from our day, this should be the last one to be dropped. The Examen prayer can be a difficult prayer to learn and to pray on our own, and that is why we have developed this app. St. Ignatius suggests doing this prayer twice daily. It helps to use the app or to set reminders to pray this sometime in the morning and sometime in the evening. Find creative ways to remember your resolution. It’s helpful that as we enter into the Examen prayer that we take a time of transition. Chances are you’ve already experienced the stress of the day, so try to calm yourself. Focus on whatever image you have of God. Just try to let yourself feel His Presence. Maybe for you, it is being held in the arms of the Father like the Prodigal Son. Maybe it is Jesus in your favorite scripture verse: calming the storm in the sea, the good shepherd holding the lost sheep, or sitting and talking to Jesus along the shore of the Sea of Galilee. Maybe it is the Holy Spirit breathing life into you. "Speak Lord your servant is listening" (1 Samuel 3:9). Again, feel free to tradition into this prayer in whatever way you are most comfortable relating to God. Finally, make the Sign of the Cross and begin your prayer... In the Name of the Father, and of the Son, and of the Holy Spirit. Pray with whatever image of God helps you to feel His Presence. Maybe for you, it is being held in the arms of the Father. Maybe it is Jesus calming the storm in the sea. Maybe it’s the Good Shepherd holding you in his arms, or maybe it’s the Spirit breathing into you. And, finally, make the Sign of the Cross and begin your prayer: "In the Name of the Father, and of the Son, and of the Holy Spirit." Remember all of the blessings of the day. Thank God for all of the good things that have happened, and all of the gifts you have received. I have found the practice of gratitude to be very helpful in my life. St. Ignatius gives five steps, but he also says that if you spent the whole time simply in the step of gratitude, it would be enough! If your heart is filled with gratitude, you may want to spend the entire time there. You wouldn’t even need to go further in the Examen prayer. The Eucharist, which means Thanksgiving, is the source and summit of our spiritual lives, and therefore, it ought to be the source and summit of our personal prayer as well. It is so good for us to be grateful. All is Grace. All is Gift. Everything is Holy. Everything’s a Miracle. It is also beneficial if our gratitude is very specific and from our actual experience of the day. Being particular will help us to genuinely realize God’s gifting us in a very personal way, and it will make it real for us. So, try to remember the moments you are grateful for vividly. These moments are God’s gift to you, and there’s nothing better than a gift that is accepted, appreciated, and delighted in by God. When we are grateful and humble, it sets us up to receive God’s grace. And, realizing that he provides for us, can shift us from being demanding and despairing to delighting in God’s goodness and the joy that will follow. Being aware of God's goodness and realizing how God wants to provide for us is why gratitude is the first step! As you begin to think about your day from the time you woke up until now and thank him for the gifts that you have received. And, more and more, we will realize that all is Gift. Gratitude sets the foundation for trusting God, and once we have this trust, we can begin to look at our lives and allow ourselves to see our lives as God sees. Take a moment to journal what you are grateful for before you continue to the next point. Being aware of God's goodness and realizing how God wants to provide for us is why gratitude is the first step! So, try to remember that moment vividly. There’s nothing better than a gift that is accepted, appreciated, and delighted in by us. “Ask and it will be given to you; seek and you will find; knock and the door will be opened to you. For everyone who asks, receives; and the one who seeks, finds; and to the one who knocks, the door will be opened" (Matthew 7:8). It’s important to try to articulate what it is that you desire at this time of prayer. So, try to really think about your prayer as being a personal prayer to God and what it is that you desire. You can simply say a verse from scripture. Lord, help me to see myself as you see me. Father, reveal to me whatever you would like me to see. Father, can we talk about today? Father, can we look over my day together? Father, can I share my day with you? Father, will you spend some time with me talking about our day together? However it is, try to petition God in your own personal words and try to express your deepest desire. King Solomon prayed the beautiful prayer of petition: "Give your servant, therefore, a listening heart to judge your people and to distinguish between good and evil." The Examen prayer is a gift from God, and with all gifts, we must ask God for the grace and then receive it. Instead of demanding and forcing or trying to make this prayer happen, the best thing that we can do is ask. Take a moment now and ask God to give you the grace. It may help to say it out loud. It is also helpful to journal your prayer. Go ahead and try it now. Review your day with the Father and ask Him to help you realize when you were with God or when you were moving away from God's love. The purpose here is not to look back at our day and judge ourselves as good or bad, but to share our lives with God, our best friend, our greatest love, our most intimate companion. And, it is in this sharing our day with God, in reviewing it with loving attention, that we will begin to see His plan for us with greater clarity. This time of discernment will be a time for us to share the different things that happened during our day, pay attention what you are feeling, and allow God an opportunity to give us some insight and guidance. Hopefully, as we pray the Examen and become more and more familiar with the way that God acts in our lives and we will become aware and very sensitive to the interior movements of our soul. There will be times when we will feel drawn towards God, and we experience an increase of faith, hope, and love. St. Ignatius calls this consolation and desolation. When we are in consolation, we experience a movement towards God, and an increase of faith, hope and love and all that is good. In desolation, there is a spiritual movement away from God, a sense of having a spiritual blackout, a sense of distancing from God with a decrease of faith, hope, and love. This time of discernment will help you us to be aware of God’s presence in our lives and how present we are to him. This point of review helps us to discern the spirits that are operating on us throughout the day. Sometimes God is leading us, and other times the enemy may be tempting us away from God. Saint Ignatius suggests reviewing your day hour by hour, and moment by moment. But if you find this too tedious, try to think of one moment, one movement of your heart, one incident where you felt consolation or desolation. And, ask God for some insight into that. Maybe it was a moment of joy or laughter. Perhaps it was a time of struggle or stress or difficulty. Share this with God, and you will find him bring insight, guidance, and wisdom, and there will be a great sense of unburdening. Remember this is not supposed to be burdensome; it’s actually a wonderful time of unburdening ourselves with God. Notice that God will bring certain moments to your memory. Pay attention to these memories and let God help you make sense of them. Remember that you have begun with gratitude and petition. Now let this be a time for God to answer your prayer and help you to see how He has been working. This step is a time to look at our lives and see where God was present and how we responded. If he invited us into intimacy, did we go there? Was there a part of us that was reserved or afraid? Did we find times throughout the day that we were distant from God, angry, desolate, alone? If there was a difficult or painful time, talk it over with God. Ask Him for clarity. "God, can you make sense of this with me? Why did I turn from you? What was I seeking?" Inevitably, some sin will arise on our part, but in the Examen, if it’s prayed correctly, it will not bring about a sense of self-judgment or self-condemnation, but genuine sorrow and a contrite heart as well as an immediate experience of God’s mercy and the Father’s unconditional love. Often, the area that we need to look at, we tend to hide from because it’s painful and difficult to look at, but if we do the Examen with the safety and security that God can offer us, we will realize that we are not doing this on our own. We don't have to fix ourselves. Gods got you! We hear in the gospel of John: "I cannot do anything on my own” (John 5:30). And, frankly, why would we want to do it on our own? Why would we want to look into the dark parts of life by ourselves? God is with you through it all. The good, the bad and the ugly! And, as we pray this point with the Father, there will be a growing awareness of our sinfulness and God’s unconditional love. And, it’s only out of this love that true conversion happens. And, it’s not just us trying to fix or change ourselves. Spend a few minutes now to review your day with God. It may help you to use a journal. Is there a specific moment when you noticed a shift in your day, a change in your moods, a feeling of closeness or separateness from God because this is Holy ground. It’s a sacred experience, especially when you look at it with the Lord. Let God show you how to Discern! You will experience a great sense of unburdening. It's not supposed to be tedious or burdensome let the Holy Spirit help you. As mentioned earlier, the Eucharist is the source and summit of our lives and also the model for our personal prayer. Every mass begins with a penitential rite. We call to mind our sins, and we ask God for his mercy and forgiveness. This act of sorrow, especially in the context of St. Ignatius’ prayer of Examen, is not about shame or self-condemnation, but again, as with all the other steps, it’s about experiencing God’s love. Try to be as specific as possible. Try to really express whatever the incident was that happened. Try to name it. Bring it to the light and actually share it with God. Our expression of sorrow could be anything that we noticed drawing us away from God during the day. This step is an opportunity to return to God let ourselves be loved by God even in the midst of our sinfulness, even in the midst of turning away, even in the midst of revealing ourselves to God as he gently reveals our sin to us. As in all human relationships, when we reconcile, our relationships become even stronger than they were before. And so it is with God when we go through this step in a personal way with God, The Father, Jesus, the Good Shepherd, and The Holy Spirit, we will grow together in intimacy and love. It does take great courage to admit our faults. It takes courage to realize we did something wrong. And if you’ve ever had someone do this for you, you know how humbling it is, and how inclined we are to be merciful and forgive. How much more merciful is God? The wonderful thing about this point is that the more we experience God’s mercy, love, and forgiveness, the more we will become merciful, loving and forgiving. And, we know from the Our Father, the perfect prayer, the greatest prayer that has been given to us by Jesus. In this prayer, Jesus teaches us that we will not unless we forgive God will not forgive us. It will also be very difficult for us to forgive without experiencing being forgiven by God. And so it’s important that we be specific, particular, concrete in the examples we use because that’s where God wants to meet us and reconcile with us. When Jesus took on human flesh, he was born in a stable. If you've been in a stable you know, they aren't the cleanest place! But it is in our mess that God wants to be. He continues to be present to us right in the messiness of our lives. He comes to us in our mess. He comes to save us from our sins, and he can redeem us from anything we share during this prayer. If you are still troubled, St. Ignatius suggests seeking a "wise spiritual person" who can help you. It’s important that this part of the prayer is never done by yourself, but always done with God. If we’re doing it alone, it becomes a time of beating ourselves up, of judging ourselves, of abuse, of shame, of guilt, of anxiety. None of this is the intent of the Examen prayer! The Examen prayer, prayed with God, though it may include some of these feelings, will be ultimately one of experiencing the Father’s unconditional love for us. As with the other steps, it’s really good to journal and to just get it out. Through the act of journaling, we get it out of our heads, and we place it before God. You may also find yourself with some sin that is difficult for you to process, and if there is any sin that keeps coming up, or it’s a grave or serious sin, it would be wise to bring this sin to confession. St. Ignatius suggests that we "seek a wise spiritual person" who can bring some insight and walk with us. If you find yourself with some sin that is difficult for you to process, or if there is a sin that keeps coming up or a sin that is if there is a grave or serious sin, it would be wise to bring this sin to confession. Remember, when you go to the Eucharist and when you go to confession, try to remember this sin, so that you can experience God’s forgiveness in and through The Sacraments. Your life will become more and more enmeshed with the sacraments. Ultimately, God wants us to experience his love and mercy, not only in the depths of our heart, but also through human hands, human voices. And this is why we are given the sacraments. Spend a few moments looking back on your day. If there is anything you feel sorry about, any time that you may have messed up either by something you did or failed to do, share that with God, tell him you are sorry and experience His unconditional love and mercy. It may also help to journal this experience. Admit we are sorry and experience his mercy. It’s important we don't try to do this part by ourselves, but always with God, The Father, The Son, and The Holy Spirit. If you are still troubled, seek a wise spiritual person who can bring some insight. This final point flows so naturally out of the previous steps. Having come to reflect on our day with God, we will probably want to make some concrete change in our lives or make a renewed commitment to remain in his love and avoid anything that would lead us away from staying in God’s love. This resolution will probably be different from day to day. It doesn’t have to be some radical conversion, though it may be, or some unbelievable change, though it may be, but rather a more simple, concrete, practical and doable resolution for the next day or the next period before your next formal Examen prayer time. Rather than us trying to come up with the resolution on our own, hopefully, like the other steps, this is an experience of something arising in our hearts inspired by God. You'll know it's from God because it will give you an increase of faith, hope, and love. We often know it's God because it just "feels right." He gives us a sense of hope, of goodness and of confidence that not only all is well, but something about tomorrow or our next period is going to be even better than it was today! Near the end of his life, St. Ignatius would say that whenever he wished, at whatever hour, he could find God. The same could be true for us. 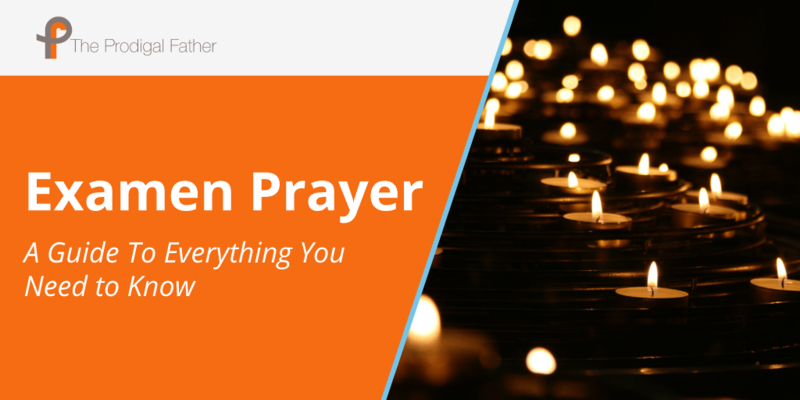 The Examen Prayer will help you stay connected with God. The more and more that we do this during specific periods of our day, the more that we’ll find God throughout our day. When we remain in God’s love and his consolation and are aware of his presence in our lives, his word and direction become so clear, so evident. And, if we realize that we are being guided away by the evil spirit, we will much more quickly become aware of that, instead of jumping into something else or escaping into fantasy, we can now turn our attention once more towards God. The more we pray the Examen prayer, the more we will dwell in his consolation. The less we will experience separation from God and the more quickly we will return if we have been misguided. The Examen is a way for us to remain in the unconditional love of the Father. In the beginning, this may be a difficult act for us, requiring some discipline, but after a while, it will become not only something we force ourselves to do, but love doing and look forward to doing because it becomes spending time with God who loves us and delights in us. This prayer becomes sharing your day with God, sharing your life with God, every moment with God who loves you beyond what anyone else ever could. We will begin to live our lives more fully aware of God's presence. What starts as structured prayer a couple of times a day will become an experience of God throughout our day! We will become aware of God’s love, his presence, and very quickly realize when we stray from it so that we can more immediately return to the source of our life and the source of our love. The resolution that you make will help you ultimately not only experience God’s love during the time of the Examen but to live it out in your life accordingly. If you are using the Examen Prayer App: Once you enter this resolution into your journal, it will automatically come up as a reminder, and often, I find myself making a resolution, but I go to bed, and I wake up the next day, and I forget what the resolution was. The genius of this app is that it will remind you. You may also consider reminding yourself twice a day by setting a timer or and alarm. So, when you wake up in the morning, the first thing you’ll see is the resolution you made from the previous day. If we make resolutions with the Examen Prayer every day, we will find our lives dramatically transformed by these small, daily resolutions, slowly, but surely, keeping us focused and directed and following the call of our Lord. Spend a few moments with God and notice any resolutions that may arise. Is there anything you would like to change? Is there a commitment God is calling you to make? Is there anything it seems God is asking of you? You will know it's God when it "feels just right." When we make a resolution with God, our faith, hope, and love will increase. You will feel a sense of encouragement from the Holy Spirit. It helps to log your resolution in your journal. You may also want to find other creative ways to remember and remind yourself of the resolution that you have made. This resolution will probably be different from day to day. It will probably be rather a more simple, concrete, practical and doable resolution. As you come to the end of the Examen prayer, allow for a time of transition, just as you did in the beginning. Go back to the image of God that is most relatable for you. The great Socrates once said: "The unexamined life is not worth living." When we pray the Examen prayer faithfully, we will find that life is worth living and the examined life is greatly worth living. You have just spent some quality, wonderful time with God. So, take a moment just to be grateful for this loving attention from God and begin to look now to the rest of your day with great hope and trust that the resolution that you made with God will not only impact your day but help you be aware of the Father’s loving presence with you always. Remember to pray this prayer every day so that the Father can remain in you and you can remain in him. You will find the grace and all the blessings of this prayer will begin to help you to live a life in constant awareness of love and forever dwelling in the Father. And may the Almighty God bless you and keep you in the name of the Father and of the Son and of the Holy Spirit. Remember to pray this prayer every day, twice a day. If you found this introduction to the Examen prayer beneficial, check out our Examen Video series. You'll receive videos where I share my personal witness through story and song. I will guide you in greater depth through the Examen prayer, delivered straight to your inbox.